There is more than one face you've seen before. From Peyton Manning and Drew Brees to Jeremy Shockey and Reggie Wayne. However on Super Bowl Sunday these are the players you'll have to pay attention to. 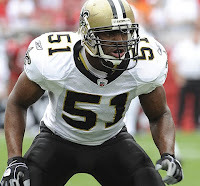 Jonathan Vilma, LB New Orleans Saints As a captain of the Saint defense, linebacker Jonathan Vilma led the team with 110 tackles this season. In just his second season in the bayou, Vilma had career highs in both sacks and interceptions while trolling the middle of the defense. In 2009, under the guidance of defensive coordinator Gregg Williams, Jonathan Vilma has transformed into a dominating leader on defense. Come Super Bowl time, Vilma will be on center stage and he'll play a monster role. As one of Peyton Manning's favorite targets, tight end Dallas Clark has abused opposing linebackers all season long. See Houston Texans rookie linebacker Brian Cushing, who watched Clark snag 14 catches for 119 yards in a week nine loss to the Colts. This is the type of potent offensive weapon Jonathan Vilma will have to take seriously if he wants to bring a championship back to New Orleans. Having the unfortunate job of staring down Peyton Manning and attempting to limit the most high powered offense in the game, Jonathan Vilma will have to be up for the challenge. 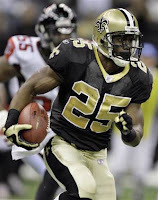 Reggie Bush, RB/PR New Orleans Saints As much as the Saints game breaker propelled them to victory in the divisional round, his muffed punt return in the conference championship almost sent them home for the season. Reggie Bush is always going to be an (x) factor in this league, his talent can't be ignored. One of the more versatile weapons on the Saints offense, Reggie is going to have to take advantage of his touches, just as he did against Arizona. As part of a backfield that was virtually non-existent against Minnesota, Reggie Bush must improve on his teams 3-yards per carry average. What that backfield can do will determine how effective their passing game can be, and we've seen them be out of this world. Furthermore, the return game is extremely important for New Orleans in the Super Bowl, giving Peyton Manning a short field is about as good of an idea as leaving your cell phone unlocked (cough, cough, Tiger). That's where Reggie Bush can really make an impact, his breakaway speed, ability to stop on a dime and make tacklers miss will set up Drew Brees with an offense that can put points on the board quick. 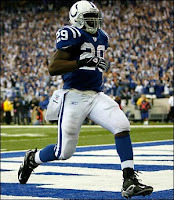 Joseph Addai, RB Indianapolis Colts In the most high powered passing offense why would a running back be important? Because the Saints defensive backs are very good and in two games this postseason, their defense also gave up well over 200 rushing yards combined. Both Addai and rookie Donald Brown are going to have to take advantage on the ground. Now Joseph Addai isn't your typical 100 yard rusher, he's a grinder and that's exactly what the Colt offense calls for. Addai has the ability to control the game by keeping Drew Brees off the field, by grinding it out. Addai touches the ball 15-20 times a game, but it's the play which he doesn't touch the ball that torches the defense. 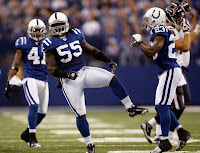 The play action from Manning is only sold when the defense respects the rush of Joseph Addai and the Colt ground game. In last week's statement AFC Championship win, Addai flew under the radar eating up the clock and averaging five yards per carry on 16 carries and put up 80 yards. It should as no surprise to anyone that Peyton Manning was able to cut up the best defense in the league with ease, because they couldn't sit back and play just the pass. If Addai can attack the 'Nawlins defense like he did the Jets, it's game over the Saints dream season. Jabari Greer, CB New Orleans Saints Before being injured in week 9, Jabari Greer was having a fantastic season in coverage on the Saints secondary. In just the past three weeks since coming back from injury, Greer has recorded 16 tackles from his cornerback spot, including 8 in the NFC Championship game. Between Greer and pro bowl safety Darren Sharper, the Saints secondary have the toughest task of anyone headed to South Florida. As Peyton Manning attempts to dissect every move they make, it'll be up to Greer and Sharper to keep those receivers in check. The fast and physical corner plays Gregg Williams defense better than most, in the face of wide outs, he'll force Peyton to go to other options giving his defense a huge challenge. If Jabari Greer has a big day, you could see Peyton Manning struggle for one of the very few times this season. We're all about to meet the former Tennessee Volunteer turned Pro Bowl corner. Clint Session, LB Clint Session Who?!? Clint Session is the linebacker you don't know. The Indianapolis Colts leading tackler (103) is having a hell of a third season in the league. We know the names like Gary Brackett, Antoine Bethea, and of course Dwight Freeney, but Clint Session has a huge impact on the outcome of this game. Session is a fierce linebacker with the ability to play sideline to sideline, if this is the guy following after Reggie Bush, they'll be in business. He's the linebacker who seems to be everywhere at the right time. A key interception returned for a touchdown in the Colts 35-27 road win at Houston during the regular season. Seven tackles helped propel Indianapolis in their AFC Championship win. At least six times this season, Clint Session has recorded nine sacks or more, impressive for anyone. On the big stage is where your going to get to see him play, a defense that was once just known for it's lighting is beginning to bring it's thunder, Clint Session is an enormous part of that.